This cleverly designed brew-and-go bottle makes iced tea prep easy. Steep, strain, chill...it's enough to ruin any Zen-infused iced tea experience. 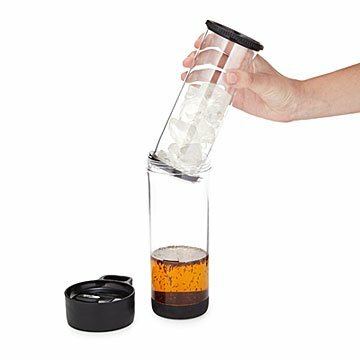 With this cleverly designed brew-and-go bottle, it's easy to make and enjoy refreshing iced tea without complicated preparation. Just add hot water to your favorite tea (loose or bagged) in the outer chamber and, after steeping, press the ice-filled inner chamber down. Screw on the lid and just like that you have freshly brewed iced tea to go, with your Zen—or at least your chill—intact. Made in China. Before first use, wash all components separately in warm and soapy water. Unscrew lid and remove inner chamber. If the inner chamber becomes hard to remove from the outer, add small amount of water to wet the silicone base, then turn the inner chamber while pulling outward to remove. Top rack dishwasher safe. I saw this for a gift to a friend. She forever is making a single class of iced tea , at home and on the go. What a PERFECT gift for her. And me, being a tea lover as well, treated myself to one, and am going to grab another one for my son who loves it also. Brewed iced tea is the only way to drink it so bought this for work. Love that I can use loose leaf tea right in same vessel but wish it came in a bigger size. Any plans to make it in glass? This works like it says it does! The receiver of this really liked how simple it is to use and the way the tea tasted. I am considering getting myself one now!